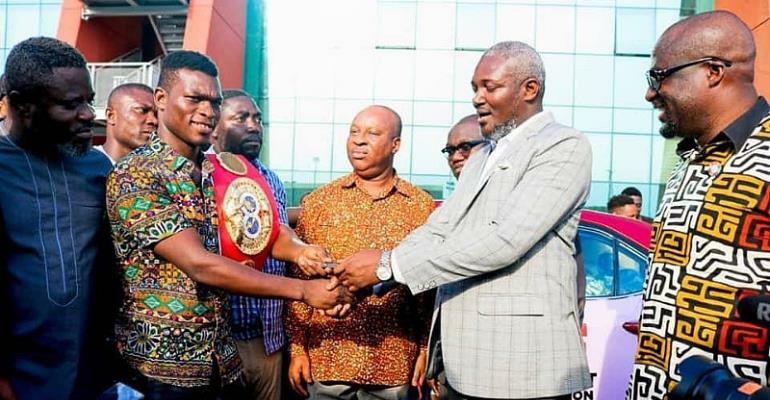 Ghana Boxing Authority (GBA) President, Lawyer Peter Zwennes has applauded government’s decision to honour the reigning International Boxing Federation (IBF) World Champion Richard Commey with a brand new car as well as a cash prize. Richard Commey defeated Russia’s Isa Chaniev earlier this year to become the new IBF world champion. After achieving that feat the boxer made history by becoming the 10th world champion to have come out of Ghana. Having visited the Flagstaff house to present his world title to President Nana Addo Dankwa Akufo-Addo, His Excellency awarded him with $50,000 and promised him a brand new Toyota car. That promise was fulfilled on Wednesday, March 27th, 2019, when the Ministry of Youth and Sports handed over a brand new 2019 Toyota Corolla to Richard Commey. Speaking on the sidelines of the handing over, Lawyer Peter Zwennes indicated that he is impressed with the gesture as he believes a country must always do well to honour its heroes. “A nation must honour its sporting heroes and I believe then when those who achieve laurels are duly honoured it will spare on and encourage others to follow in their steps and to continue to make this country proud”. “Richard Commey as World IBF Lightweight champion has indeed made us proud. Two weeks ago when we presented his title to His Excellency, the President on the initiative of the Ministry of Youth and Sports and the National Sports Authority, the President made the Solemn promise of presenting this vehicle to him”, the GBA president stated.